[New for 2017] In general, we seem to get one new Klondike flavor in their main bar line up every year. As a disclaimer, my respect for Klondike has waned over the years as their products become cheaper and cheaper (and therefore somewhat of a shadow of their former glory). About the same size as a B&J's pint slice actually (but about 2/3 the calories). The swirl is quite thin looking, so how will it pack much of a brownie punch? Overall it's a decent chocolate snack but fudge brownie it is not but maybe I am being too picky. I turn to my daughter and ask her if she thinks it tastes like brownies. The answer is a no. She tastes chocolate and that's about it. How odd. Based on the name, it seems like this is in direct competition with the decadent chocolate fudge brownie pint slice from B&J's, but in a vastly inferior way. It's fine if you dig Klondike but it would not be a fair fight if you put these two together on the same plate. One has a ton of flavor and brownie chunks and the other has a thin boring swirl. One more strange thing is that I didnt really pick up that distinct shell flavoring that you usually get from a klondike bar. I'm guessing it's just lost with all the other chocolate components. There is a little somethin' somethin' on the backend (aka the aftertaste), it must be that brownie flavor that was supposed to show up but it actually tastes more like coffee than brownies. Pretty sure that is not what they intended. So in closing, this is not a bad klondike bar, but like so many other treats, the name is meaningless. 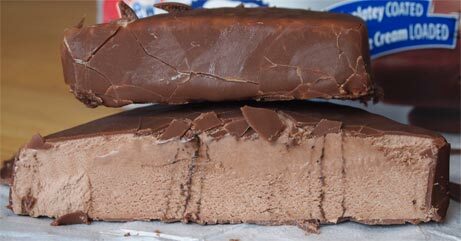 This is a chocolate Klondike bar and not much else. On Second Scoop: If you like chocolate klondike bars, you'll like this new variety. If you were hoping for anything more, just keep walking (or at least wait for a sale). The brownie swirl just doesn't have much of an impact. Is this basically the Double Chocolate Klondike Bar repackaged and renamed? I love the Double Chocolate Klondike Bar and it might be my favorite one from Klondike, so if this does not have anything special to add to that same bar, then Klondike will have let me down. Yeah, that's pretty much the point of the review, it's only mildly different. Like you have to really focus on that mild bump from the brownie swirl. You could easily inhale this treat and not notice it. If you like the other one, you will like this, you'll just wonder what the point of the name is.